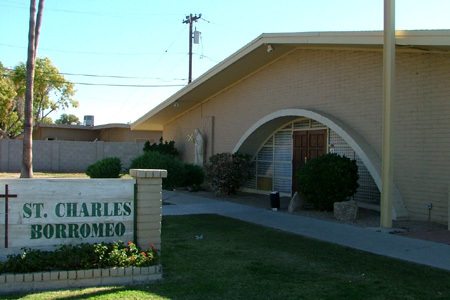 The church: St Charles Borromeo, Peoria, Arizona, USA. Denomination: Roman Catholic, Diocese of Phoenix. The building: A low, squat brick building. The inside is low-ceilinged and wide, and well lit thanks to some skylights. The walls and pews are light beige. A small altar bore a purple Advent frontal and "high six" candles, and was backed by a purple hanging cloth in front of which a crucifix had been placed. The church: Judging from their website, this parish takes catechesis seriously. Each week the pastor posts his homily on the home page, and on other pages can be found detailed essays on the nature of the mass and the eucharist, the sacrament of penance, etc., as well as a variety of prayers for all occasions. 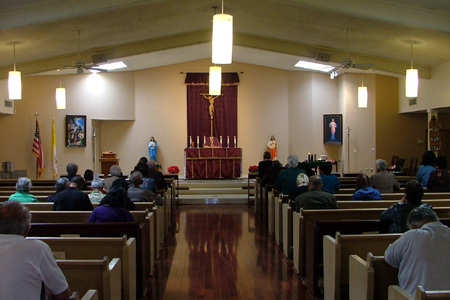 Mass is celebrated in English during the week, with the traditional Latin mass celebrated on first Fridays, and in English and Spanish on Sundays. A eucharistic holy hour for the sick is held each Friday at midnight. The neighborhood: The church is located just west of downtown Peoria, a northwestern suburb of Phoenix, on Peoria Avenue, the rather seedy main drag through town. There is an apartment complex directly across the street, and strip mini-malls and fast food joints further on down. The cast: The Revd Loren Gonzales, pastor. He was assisted by a girl crucifer wearing a red cassock and white surplice, but no other servers. The date & time: First Sunday of Advent, November 27, 2011, 10.00am. I counted room for about 400 and it was pretty much full. The Rosary was being recited. As people entered, they either joined in or abstained as they wished. The hardbound Adoremus Hymnal, a folded card entitled Roman Missal Third Edition: The Order of Mass; and three handouts: a bulletin, some Advent devotions, and a music sheet. Acoustic guitar, played from inside an alcove at the back of the church. The gentleman who played guitar also sang, and he was joined by a woman vocalist. Some of the holy persons depicted in the stained glass windows were decanonized saints, or saints not yet canonized, e.g. Philomena, Christopher, and John Paul II. 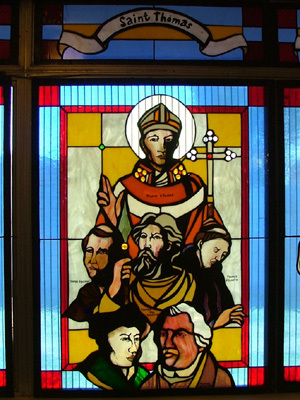 One window, labeled St Thomas, depicted all six Thomases: Becket, Villanova, the Apostle, Kempis, More and Aquinas, all helpfully wearing their names written on their garments. Standard novus ordo according to the new English translation. I detected no slip-ups on the priest’s part, but half the congregation said the old "And also with you" while the other half said the new "And with your spirit". Also, at the preface and sursum corda, most said the old "It is right to give him thanks and praise" while only very few said the new "It is right and just." 9  A very good sermon, well delivered. Advent is a time of waiting, longing and expectation – not just for Christmas, but also for the Second Coming. It is a look back into history to the time when mankind was completely changed, and a look forward to the time that only God knows. God kept his promise to send the Messiah, and he will keep his promise to send his Son again, this time not humbly but in glory. The church usually keeps vigils for only one day, but it keeps Advent for four weeks. We need to regain the spirit of Advent as a penitential time, a time of grace. The sermon was followed by several minutes of silence during which not a person coughed, not a baby cried, not a cell phone rang. It was truly heavenly. Miss Amanda could go on for hours about the Catholics and music, but what’s the point? The thin nasal voices of the two leaders of song, the guitar strummed artlessly and sometimes not in tune with the singing, the fact that few if any people joined in – it’s all been complained of before. 1  Nope, not for me. The window of the six Thomases.